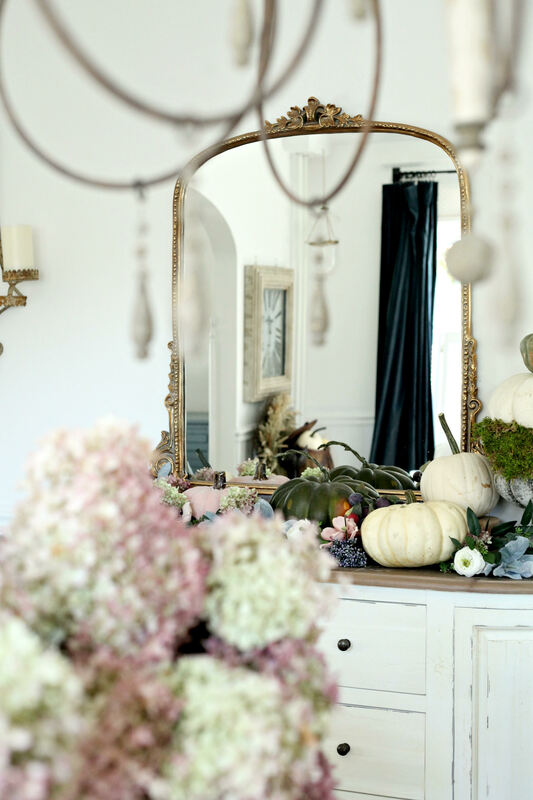 Decorating for Fall this season has been so refreshing… I’ve really enjoyed sharing the house on my own terms, and at my own speed. I sure hope you’ve enjoyed the low key ideas I’ve been sharing! 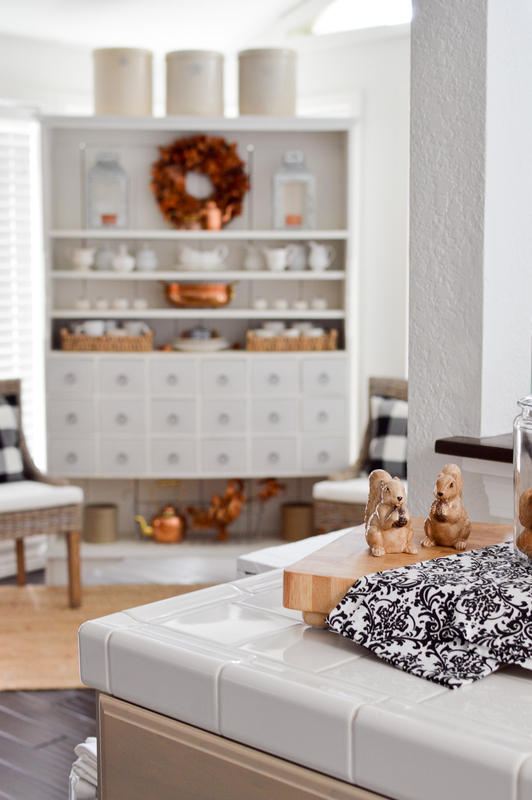 I’ve peppered the whole upper floor with seasonal touches, and so far, you’ve seen the living room & the dining room. 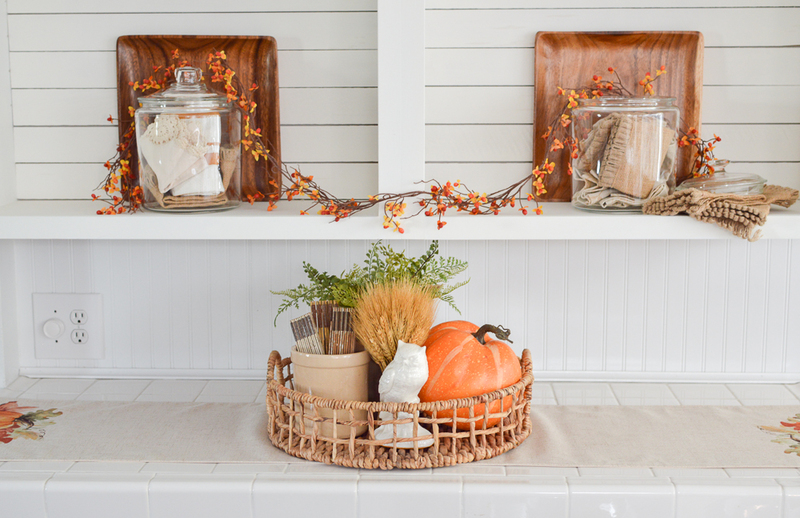 Now, it’s time to give the kitchen a little attention. 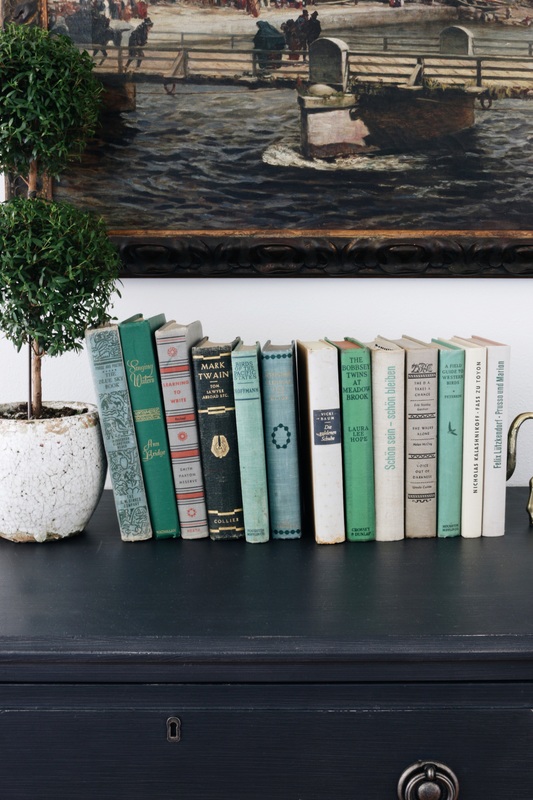 But first, I wanted to tell you that today, a few of my favorite bloggers are going to share how we mix vintage, and more modern decor in our homes! 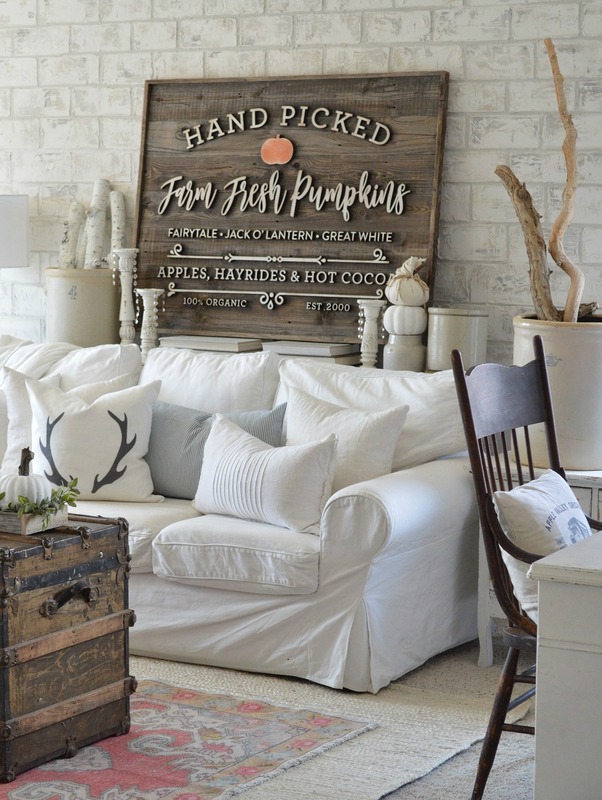 I’d like to thank my blogging friend Holli for the fun event idea, FALL-ing for vintage and modern home decorating. 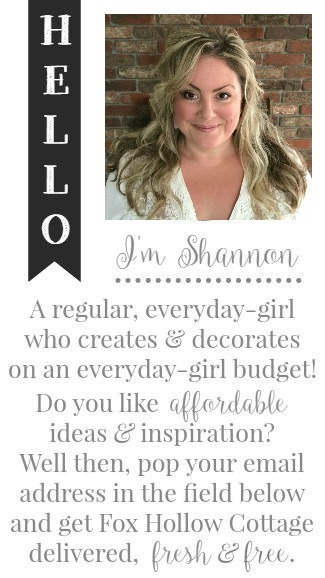 You can visit Holli, who is an avid junque & vintage lover at her blog BeesNBurlap. 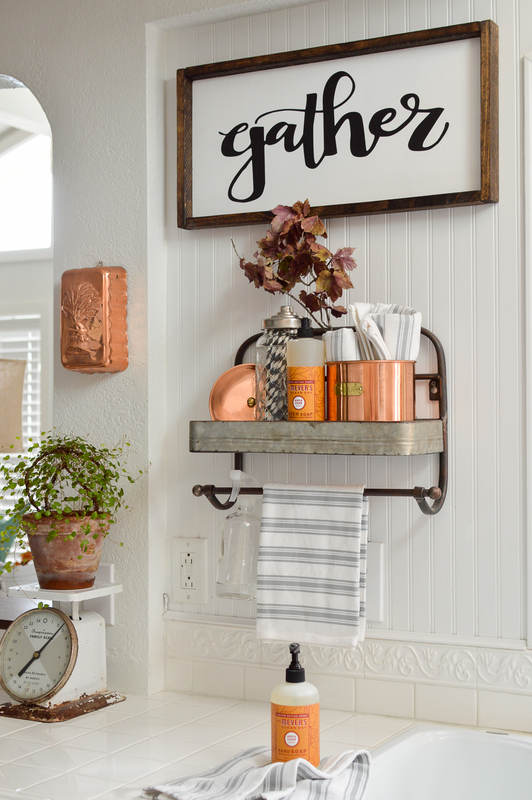 Holli finds amazing goodies and I love how she styles her open shelves… I always want to reach in and pluck thing right off them! 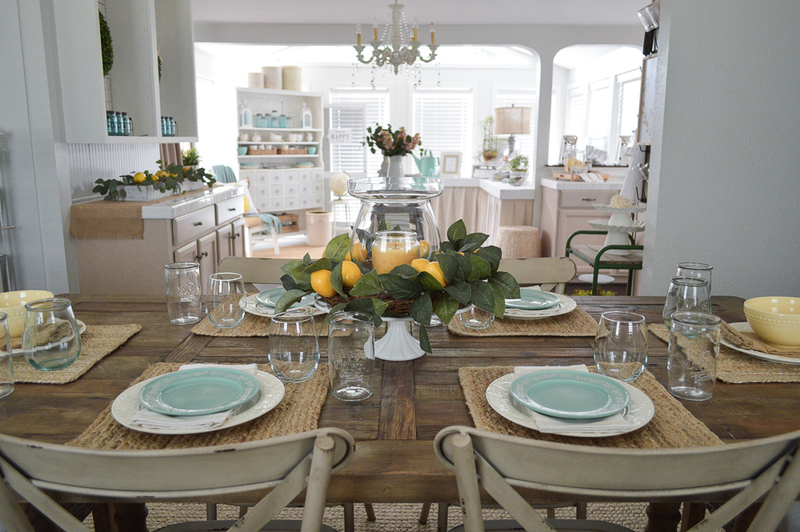 Welcome again to our cottage home, and our kitchen! 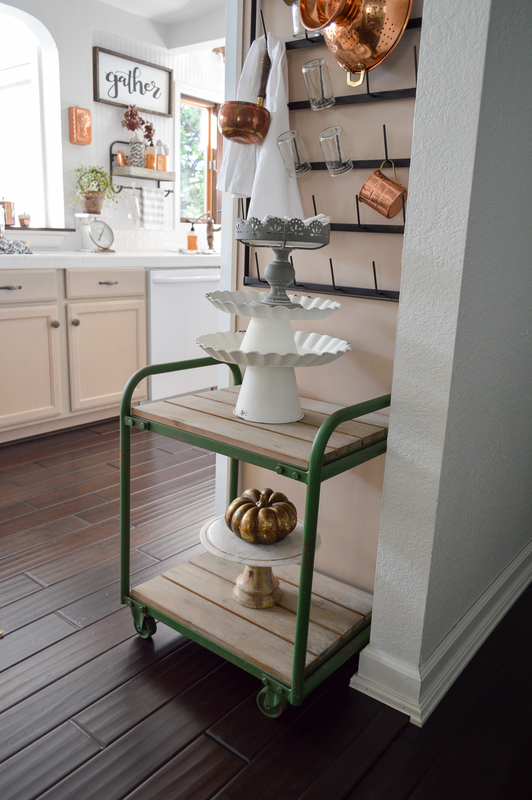 I’ve still got the farmhouse cart in the kitchen area. 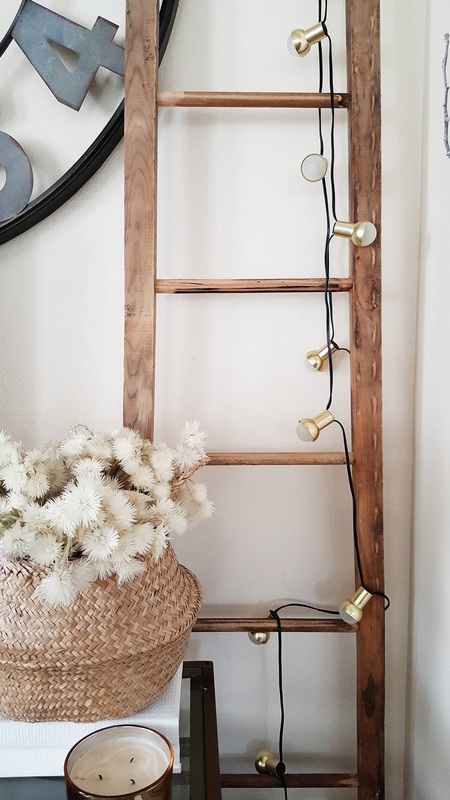 It’s got a faux concrete top, but I added a pallet wood topper for a change-up. Plus, I just love those worn white boards. After adding the wood topper, I piled it up with my vintage copper collection. Well, some of it. I pick stuff up here and there, as I find it, and when it’s a great price. 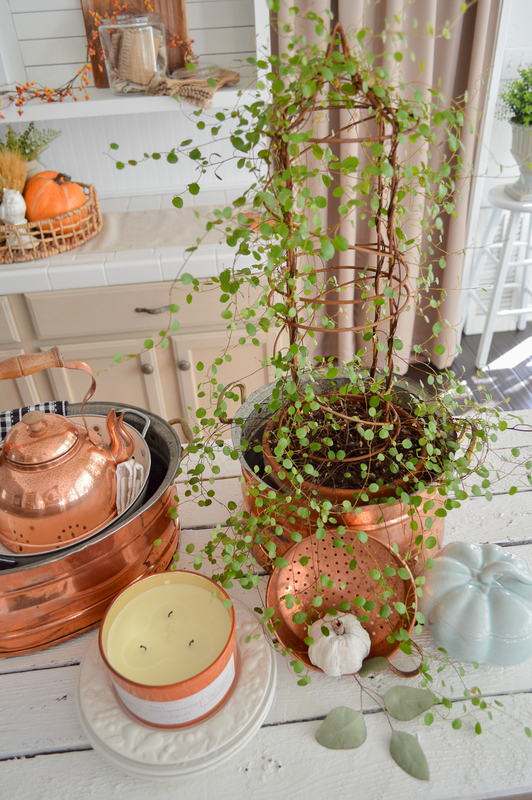 I put my Angel Vine topiary in the big round copper pot. I’m still so pleased I have managed to keep it alive. And Jimmy cared for it when I went to California last February. It’s probably more evocative of Spring… but it’s not going anywhere. If it makes it until January, I’ll have an anniversary party for it. And it’s little friend. 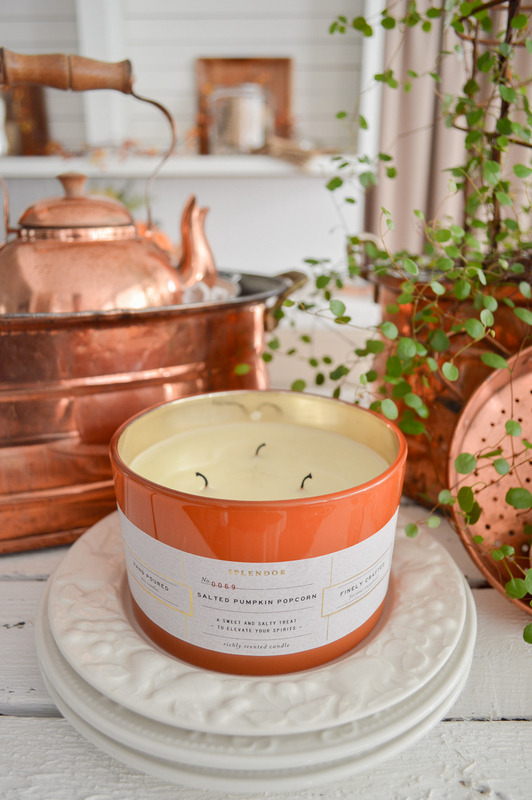 Copper is warm, lustrous and a perfect shade for Autumn. 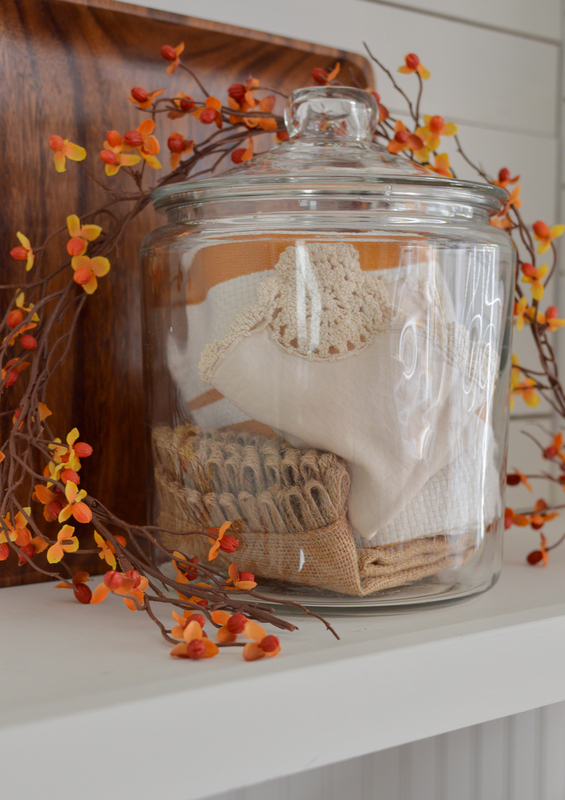 It’s a great element to add to your home to bring the colors of Fall indoors. Scents can set a mood too. I suggest rich, decadent flavors, like Salted Pumpkin Popcorn. I don’t even have to light this… and my whole kitchen smells lickable!! 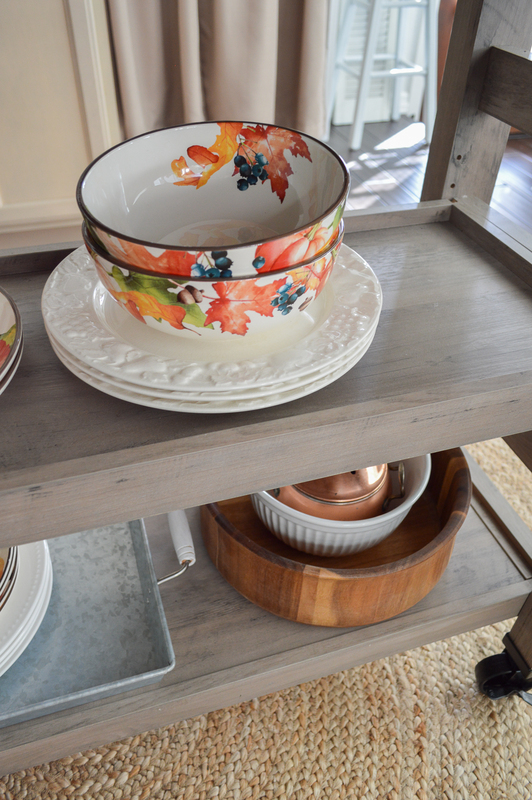 I’m keeping my Fall dishes at the ready, I think I’ve got a few more pieces I need to bring out for Thanksgiving and there is plenty of room to do so. These shelves are so handy. 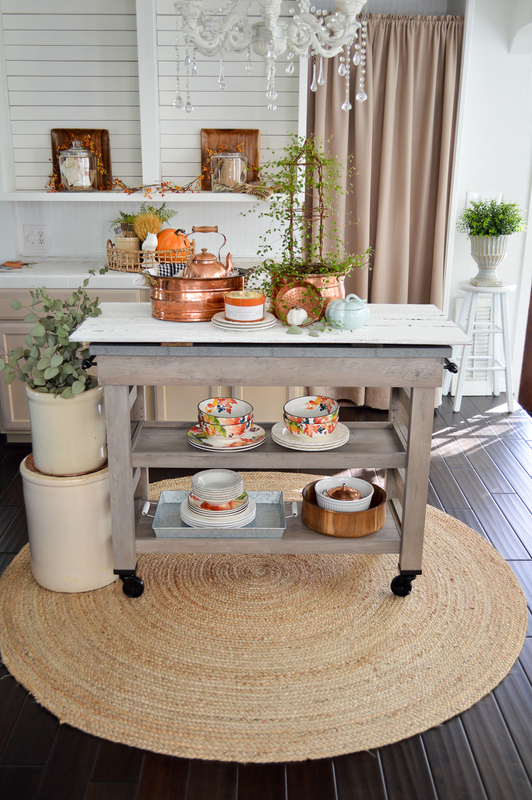 As is the cart being on wheels, it’s perfect for entertaining. 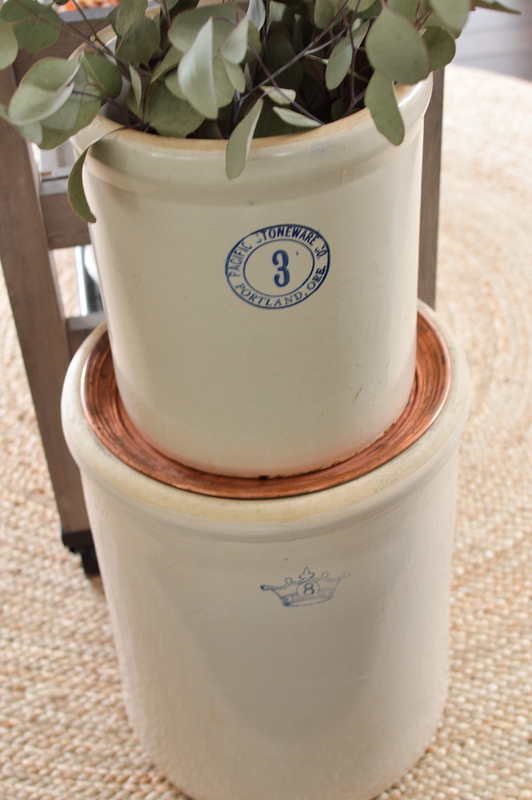 I used a vintage copper platter in between my crocks so I could safely stack them, then stuffed them with dried Eucalyptus. This is the same stuff I used fresh, for Summer. It dries beautifully. The Number 3 from Portland is my favorite since it’s from Oregon. My little bit-o-shiplap in the house is in my open cabinets. I did that myself and it was so easy! In fact, it didn’t even take a single nail. I just wanted a wee smattering and this was the perfect spot to do it! 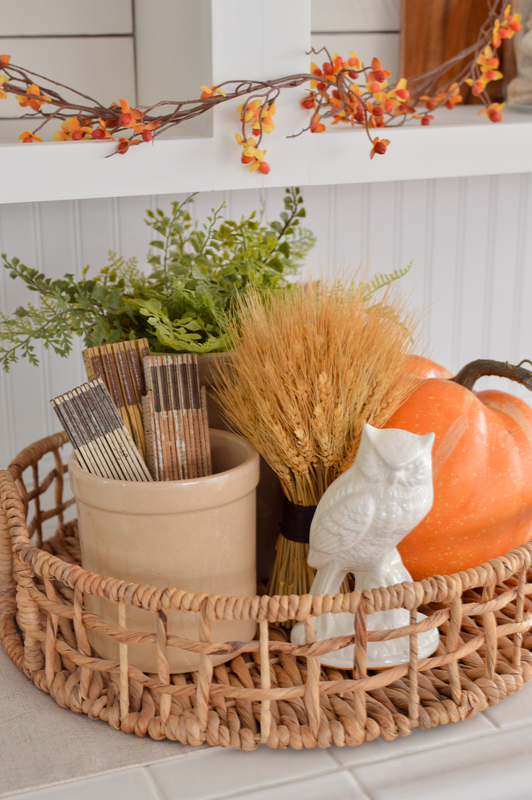 The tiny crock in the basket holds a few of my vintage rulers, a faux fern, faux pumpkin, a bundle of wheat and a thrift store owl. The faux bittersweet was a very happy find at a local vintage market. We don’t have fresh here, and I’ve wanted some for years! 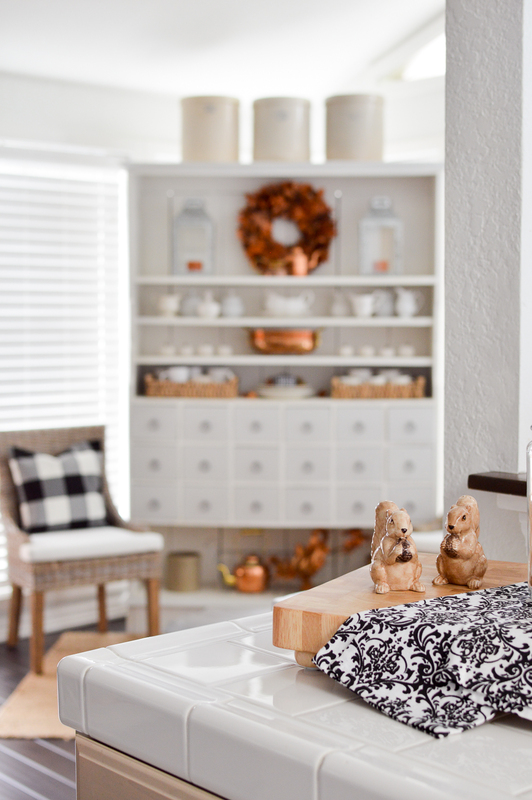 Things like these make it easy to add seasonal flair and color, without another investment. I enjoy having select faux plants and garlands. Our kitchen is a U shape, and not the easiest to get photos of. 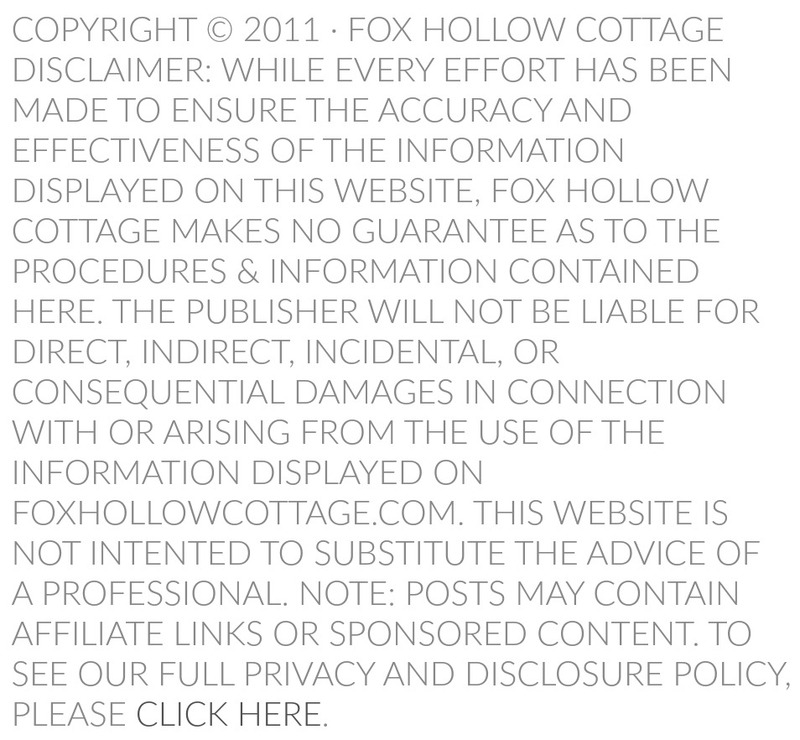 Which… is why you rarely see it. Because I try to avoid being aggravated. 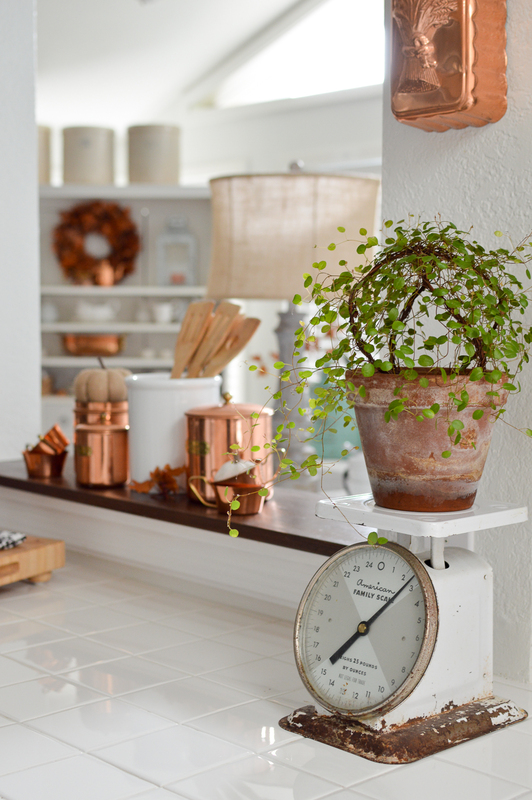 My kitchen regularly has a hearty blend of new & vintage decor. I prefer that balance. 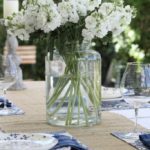 To me, vintage goods add unique interest to your home. Some may be heirlooms, handed down to you. Others may be found treasures. 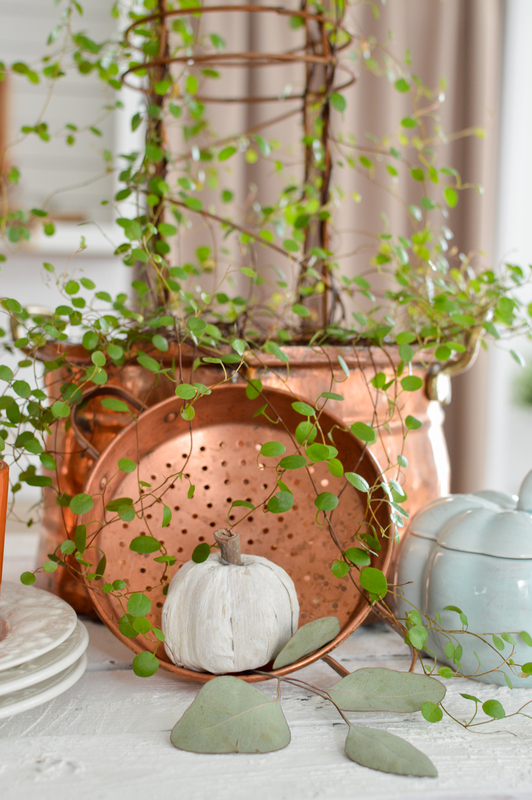 The copper, the scales, the old candy jars… my copper ladle and colander. All are touches that bring me great joy. As does the stray vintage printers tray over by the fireplace. There is a palpable warmth to the worn and pre-loved. A comfortable weight in its history. 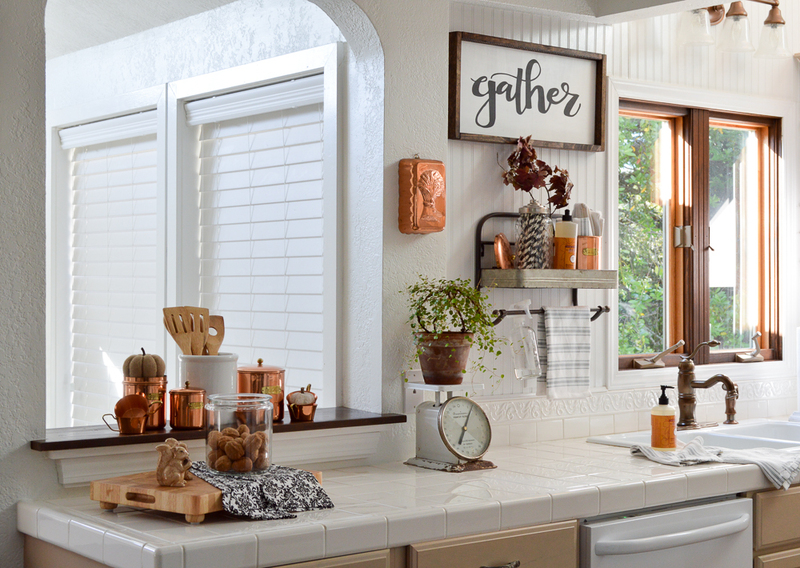 My faucet and light fixture always look the most at home in the Fall… the deep, burnished copper tones work perfectly. 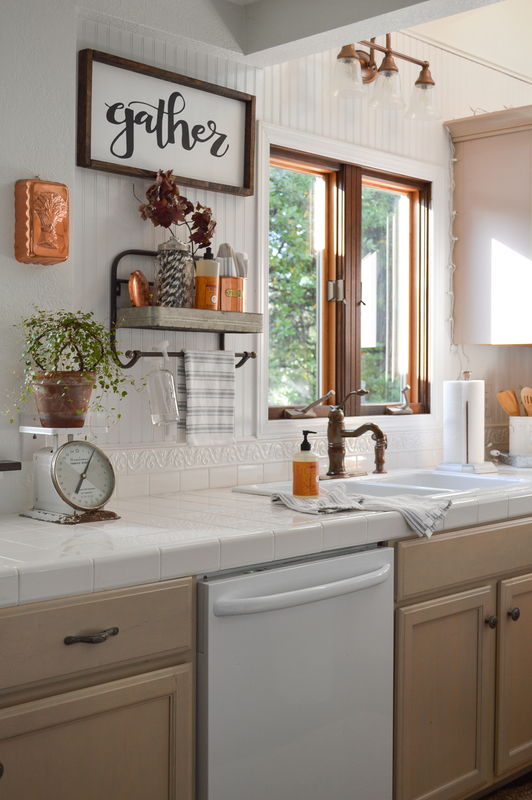 I had to paint my light fixture to match the faucet, and I still love them both. The GATHER sign was a gift from the Lolly Jane girls. You can find this and more, at Lolly Letters [here]. Wait until I share the new one I got… it spoke to me. Forcefully. 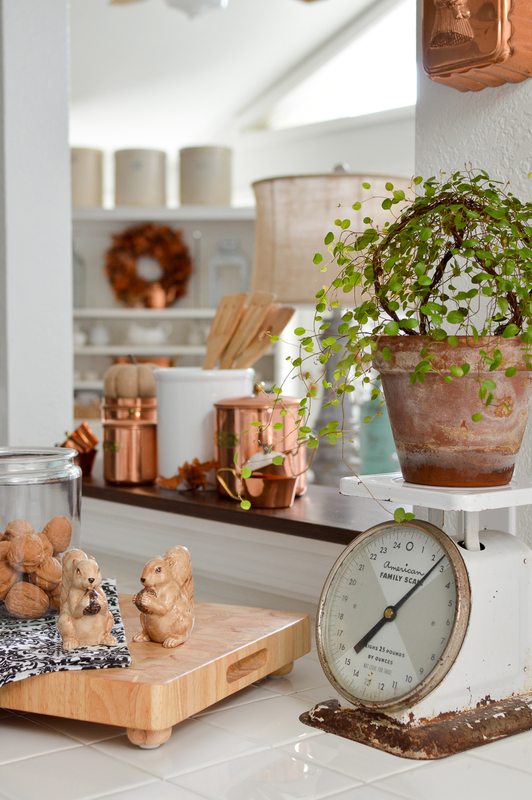 The copper canisters are a family heirloom. They were gifted to me by my Mother In Law. I will keep them for always. Below would be my favorite shot of the whole kitchen. Annnnd then I noticed the BBQ sauce on my scale. What can I say? Jim is a fantastic BBQ’er and I’ll take a little splattered BBQ sauce any day! Now, you’re either thinking I’m a terrible housekeeper. Or, you’re hungry. 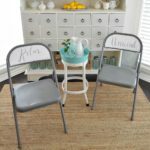 I think I’ll shush, and sign off here so I can share the other girls in today’s FALL-ing for Vintage and Modern Decor event. We can step down into the sun room next time, and take a better look at the apothecary cabinet. Now, I’d like to share some fellow bloggers I know you are going to enjoy!! Shannon, I’m so glad you were a part of this tour. 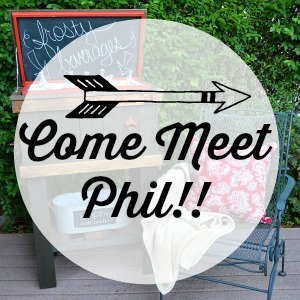 It was fun to get a better look at your pretty home and all your fun vintage goodies. I love all your copper! So beautiful. And honestly I never would have seen the BBQ (still don’t) because I was too busy noticing how cozy your kitchen is. Thanks for your hospitality!! Thanks Melissa! Same, we all get so busy, that it’s a delight to slow down and get to visit a little like in the old days. 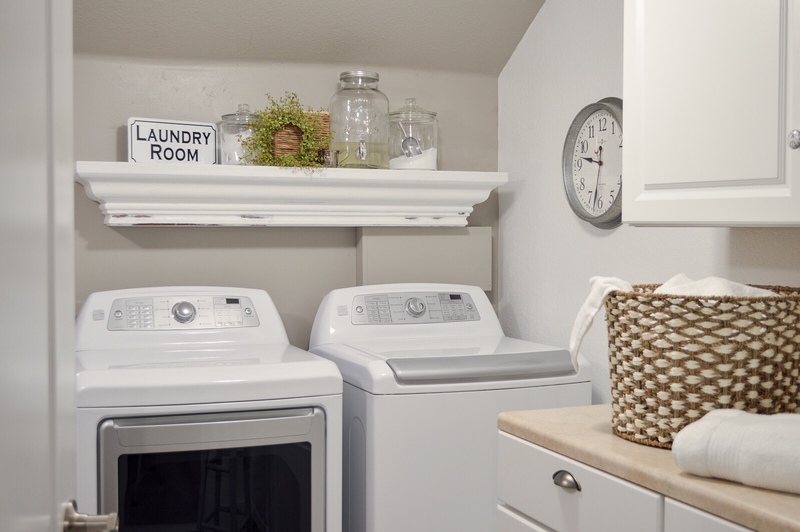 Adore your new home and all the beautiful changes you’ve been making. The new book is full of so many beautiful ideas. You are a wealth of ideas. 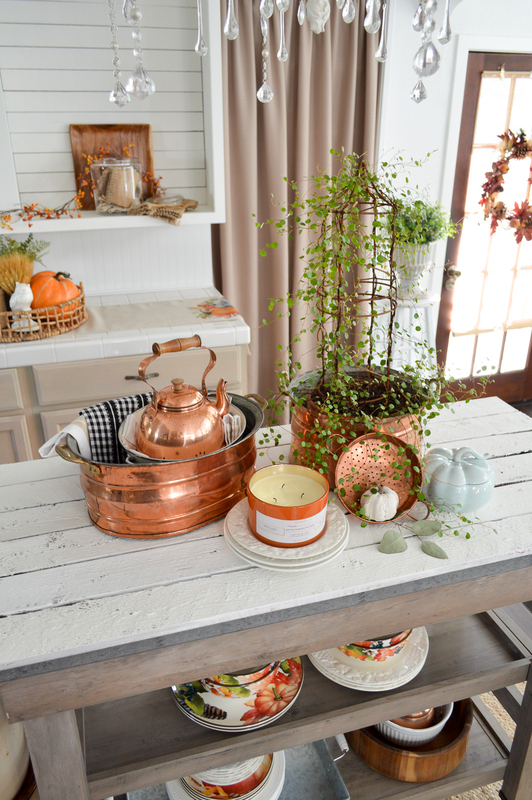 Shannon- I love all your copper and the wood top on the island and your crocks!! 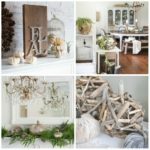 So many great finds and you display them perfectly! Hi Tanya, Thanks to much 🙂 Comments like that are so appreciated!! 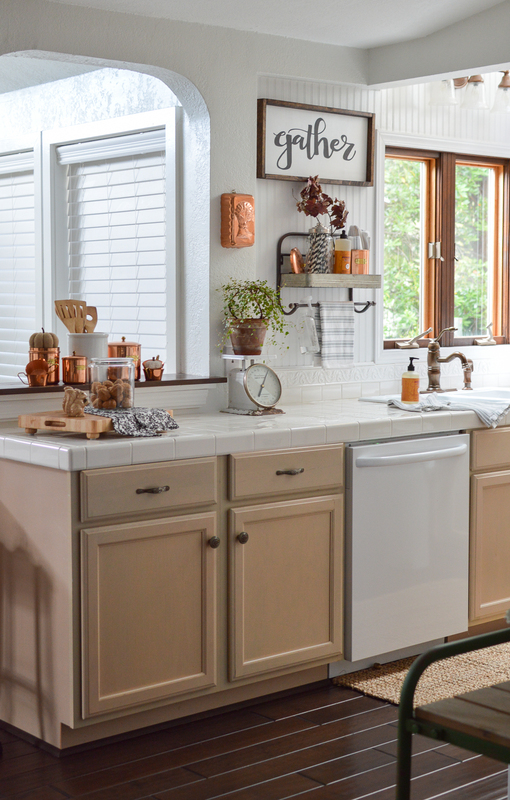 How do you keep your copper looking so wonderful?? I have tried several products but nothing of mine looks like this. Love Your posts!! Oh gosh Joy I don’t do anything special. The older pieces I’ve tried cleaning with Tarnex and they look great but revert quickly. I’m so glad you enjoy my posts, that is always nice to hear!! 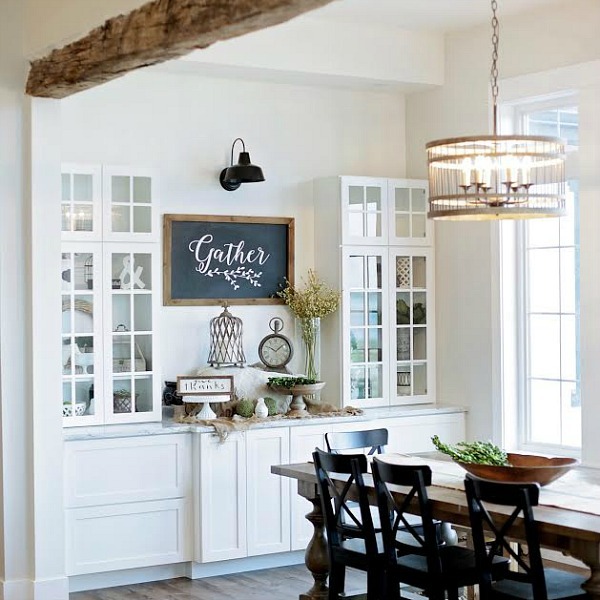 Hi Shannon, your kitchen is so gorgeous and those jute rugs look so awesome on the dark floor! 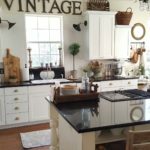 Love all your vintage touches in your kitchen and your philosophy of decorating with vintage things. I love to do the same. 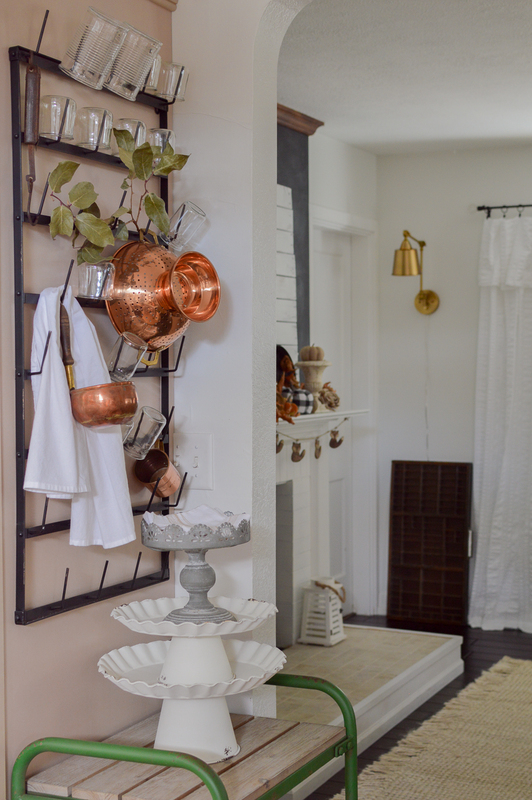 I like the way you stacked your copper pieces with your white pieces on your kitchen cart. It really makes the individual pieces shine. Beautiful and warm kitchen! Thanks for sharing! Thank you so much Jolene! 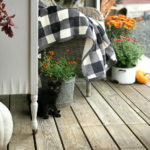 I so enjoy sharing, and discovering new vintage treasures is so fun! haha, Shannon, you crack me up! I had to “stare” to find the BBQ sauce!!! 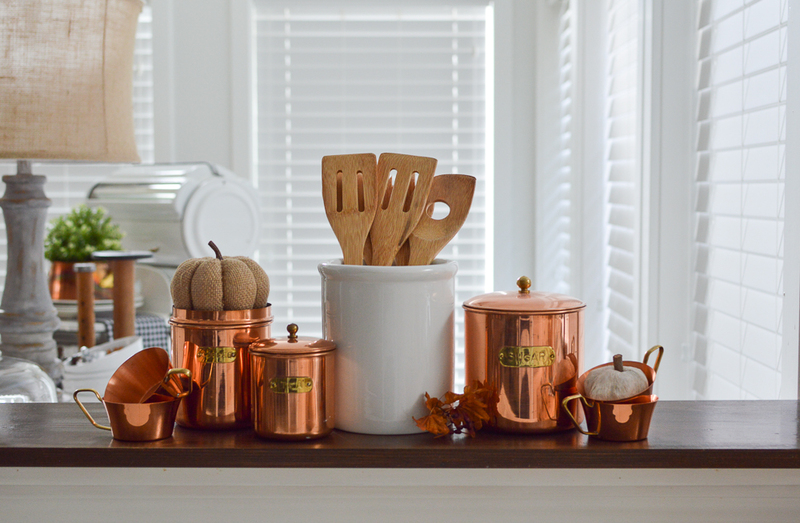 I love, love your kitchen and the copper steals my heart every time!!! Thank you for being so amazing!! Thank you for being on the Hop! Couldn’t and wouldn’t want to do it without you! Love u! 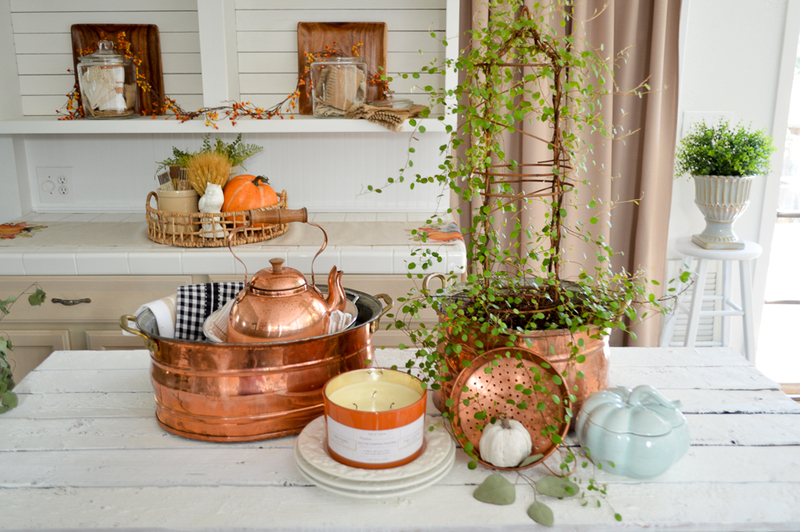 Fall is a joy, when I get to use my copper goodies – So happy to be touring with you too friend!! Love every inch of your home. You and your husband have created such a neat house. 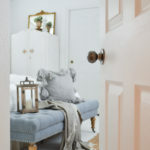 Its so inviting and I love all your attention to details. 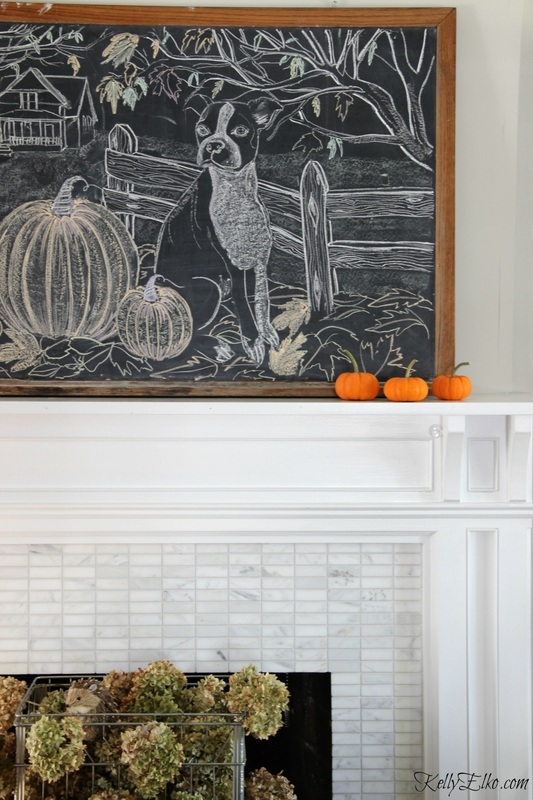 Your little fox picture is “icing on the cake” on your mantel. Your beautiful floors just shine like diamonds and your idea of putting your wreath inside is unique. As far as I can see, you have the perfect house. Thank you SO very much for the sweet comment. My husband has definitely put in some work, thank you. I couldn’t do my part, without him. I was super tickled to find that Fox print. I’m so glad you enjoyed the post, and thank you for the lovely comment. Happy Fall!! 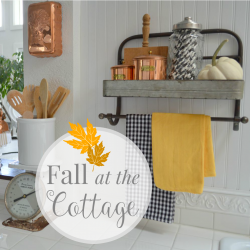 My farmhouse cart & antique scale are a few of the vintage items in our Fall cottage kitchen. 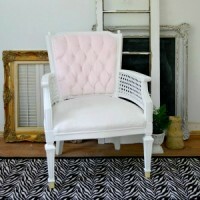 Decorating with vintage and modern adds so much interest!